I love this time of year. Well, the sudden availability of fresh and local summer fruits and veggies, not the oppressive TX heat. Just to be clear. A few springs ago my husband and I visited his Aunt Sylvia, who made us some fabulous breakfast “burros”: comforting and warm overstuffed wraps filled with fresh sautéed veggies and maybe some eggs and cheese. Since then I have been hooked on tortilla-filled creations, usually with savory fillings. However, this morning I managed to wrangle a sizable amount of blackberries from the critters that like to share my garden’s efforts and decided to shape a filling combination around these juicy tart fruits. The Honey Ricotta Wraps were extremely quick and easy to assemble. After warming a whole wheat tortilla, I spread on some local whipped honey from the farmer’s market, followed by several sizable dollops of homemade ricotta cheese (for a creamier and even richer texture, whip it with a beater first). Then I added some sliced blackberries and peaches and topped it all with barely a pinch of sea salt to contrast some of the overall sweetness. 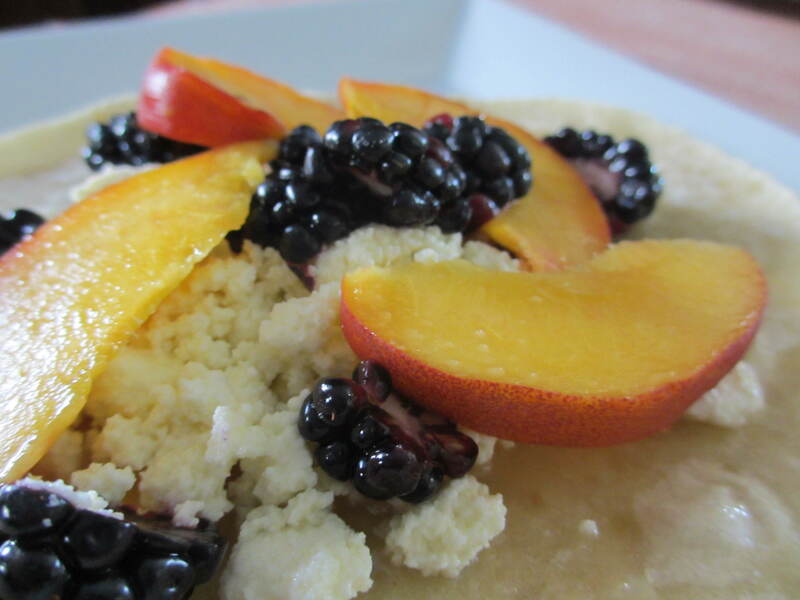 You could use any type of fresh fruit in this wrap. I bet mangoes, strawberries, and bananas would be delicious. The finished wrap was warm and comforting, and very light but substantial enough for a meal. 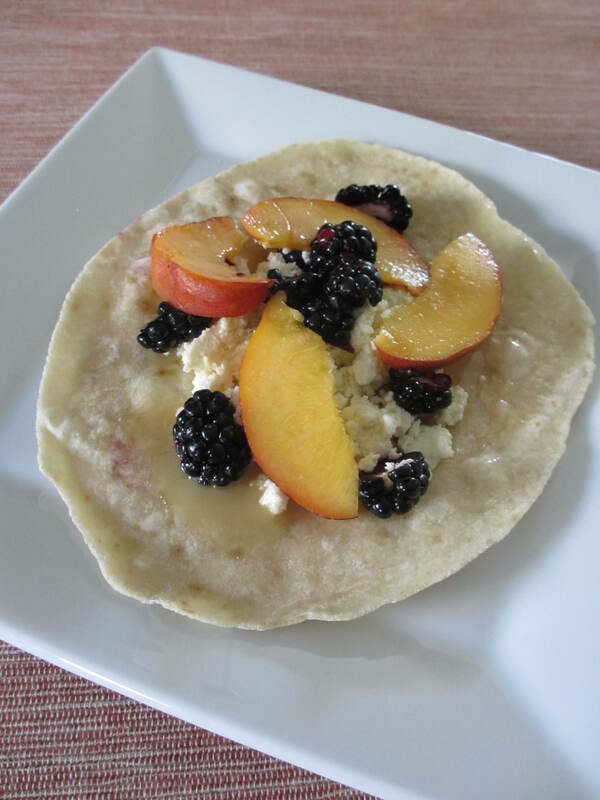 This entry was posted in breakfast, Cooking, Recipes, Snacks, Sweets and tagged blackberries, breakfast, burrito, burro, easy, honey, peaches, quick, ricotta, snack, sweet, vegetarian, whole wheat tortilla, wrap by Amy Spindel. Bookmark the permalink. yummy! w HOMEMADE ricotta– i’m impressed! 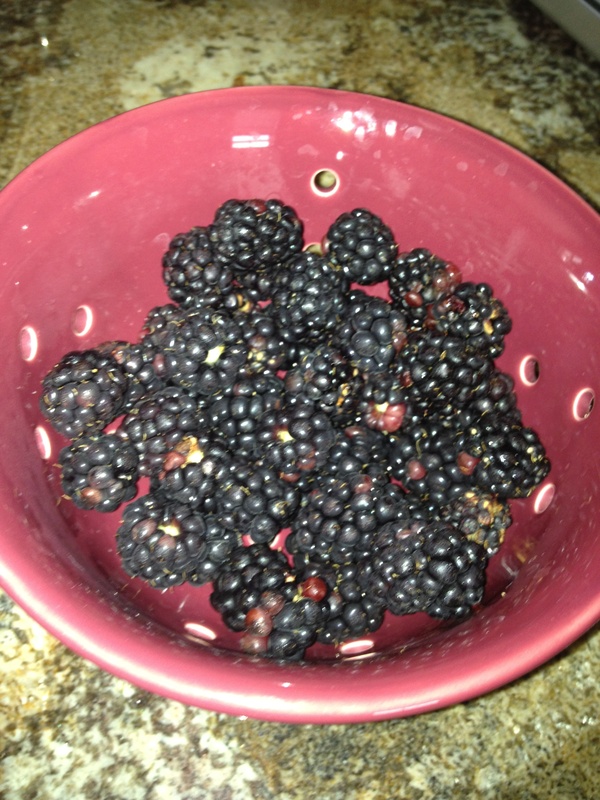 And growing your own berries- you are amazing! it all sounds quite deeee-lish!